Case is beautiful and pretty easy to build in. Only gripe is that Fractal and Newegg changed the release date by 8 days setting the build back more than a week. Great design. I moved everything from a massive ultra-tower case into this case. I use the optional "open" and "silent" configurations. I replaced the stock fans with Noctua 140mm PWM fans and this case is so very quiet. I worried about the temps and they only rose 3C idle and load above the wide open ultra-tower with the advantage of quiet operation. It is so easy to build in this case. It will fit an air cooler of any size (I have an NH-D15). It is designed to fit up to a 360 or 280 rad in front or 360 or 420 on top. So many options for cooling. It comes with 6 HDD/SSD drive trays and 2 SSD drive trays. With the "open" configuration, I was able to mount 3 SSDs behind the motherboard tray. You have options to mount the the SSD trays just above the PSU enclosure. There is one main cable channel with two velcro tie-downs that accommodate just about every cable you'll run. There is also plenty of room on the "dark side' of the case (behind the motherboard tray) by which even more cables can be run. If you look at my build called "Perpetuity" you can see just about every cable in the build is easily hidden. This case still has a mount for an optical drive, though it is very non-intrusive and not noticeable if you choose not to use it. Sound-proofing is in the top, front and panel behind the motherboard tray. The top sound-proofing can be removed to expose the dust-filter covering to allow a more "breathable" rather than "silent" configuration. There are dust filters in the top, front and bottom of this case. The front door can be reversed so the door can open to the left or to the right. You can mount a graphics card vertically in this case with the purchase of an optional PCIe extension. The window allows a full view of the motherboard and Cooler and GPU. If you're into the pretty lights, this is the type of enclosure by which to showcase them for sure. The front panel is modular and can be replaced to accommodate new kinds of connections in the future. This is really an amazing aspect of a great case and is an impressive design feature. When USB 4.0 comes out, will Fractal Design release a new front panel connection module? This will make all the difference in whether they'll support this great feature or not. The only con and it's not even to do with the case itself, but rather with the company: I tried to contact Fractal Design to order another SSD tray. I didn't get a response until a week later which was a canned response asking me to clarify the nature of my issue. I indicated it was a sales inquiry on the "contact us" form and that I was looking to purchase additional SSD trays for the case. Doesn't give me a warm fuzzy feeling when the sales team could care less about selling more things to a customer. Minus one star. Cable management is great. It's a lot bigger and heavier than I expected though. This case is great. It's not the most aesthetically-pleasing, but it was very easy to work in, and it is very high quality. 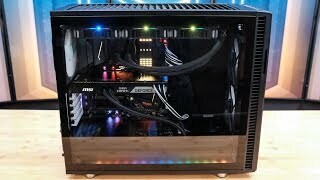 Beautiful and classy-looking, has tons of room inside for whatever you may want to fit in, lots of HDD/SSD bay, great stock cooling capability and upgradeability, and was really easy to build in. Got it in a bundle with front panel USB-C, didn't install it though (will one day, when I won't be feeling too lazy... Probably the same day I'll update my CPU Cooler).